Wyatt at the family reunion. There is nothing like a horse knocking at your door! Do you remember Wyatt's first birthday present? He is standing out the trailer door... yeah, don't think we could have kept him! Here is Wyatt playing with his cousin, he needs a shirt that Say's "does not play well with others"
well, they kind of got along. Here are pictures of Wyatt's Birthday party. Wyatt's AWESOME cake! Thanks Heather! Ok, I know, I know, it has been a while. But the reality is, that when you drive a school bus, go to school, raise a 2 (almost three) year old, come home and have to cook dinner (we eat out A LOT), and manage a house hold (not very well), some things (like the blog, dishes and laundry) tend to get put on the back burner, and sometimes end up burning lol. I am finally taking a breather this weekend. I have reviews in all my classes next week and finals the week after. THEN THE SUMMER OFF!!! YAY!! Here are the highlights of the last few months. We went to the circus and of all things Wyatt wanted to ride the pony and the camel. He said the elephant was scary. It wasnt until we were about to leave that he decided that the elephant was ok and he wanted a ride, we were out of money and it is still all he can talk about sometimes. "I want to go back to the circus and ride the elephant"
Our boy still loves horses but the elephant is definatly in second place now. Here is Wyatt with the horse that started it all, Baby Doll. He sure loves his horses! Here we are on Wyatts birthday at the bus yard celebrating. Travis has worked for 19 days straight so his party isnt until May 7th... 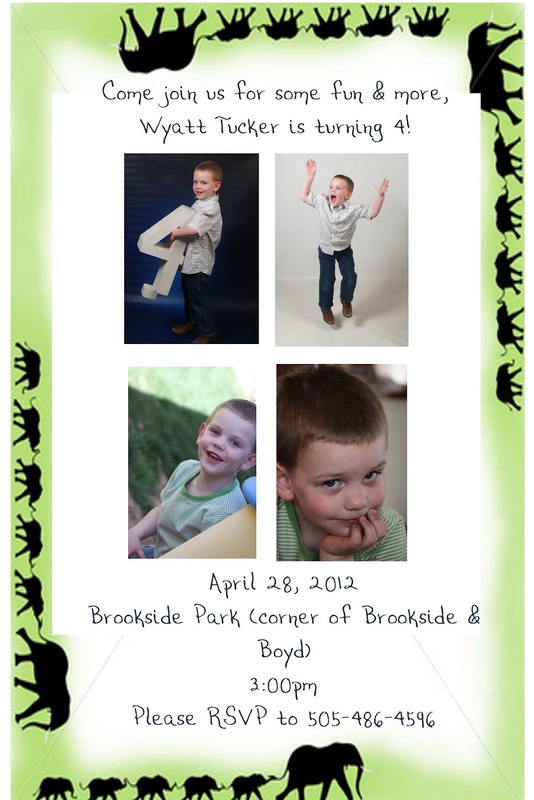 I plan on mailing the invitations today! Here we are at the church easter egg hunt, Wyatt got to practice hitting the pinata. He will be a pro at it at his birthday party. Barbara got him an elephant for easter. Man she is sure good at getting him things, he LOVES IT!! Her name is Elle. Here Wyatt is "being a plamingo (flamingo)"
And when you have every toy in the world what do you chose to do? Well, you put your tie on the back of your pants and march on all four like and elephant. I think the boy watched too much Jungle Book. Here he is ready for church on Easter, he is so hansome! and "mom, we HAVE TO take my animal with us, I buckled them, so we can be safe." Silly boy.